Alfonso X, king of Castile (and León) from 1252 until 1284, had limited success as a politician but as a scholar he was a driving spirit behind a cultural awakening in Castile in the 13th century. It is for this that he was honoured with the title “el Sabio” (“the Learned”). He favoured Castile’s language and reorganised its laws, all with the aim of unifying the country and providing it with a coherent sense of identity. Although language and laws help define a country’s identity, underpinning it all is a sense of a community’s history. Alfonso X sponsored two works of history, but entirely in keeping with his patriotic spirit, they were written in Castilian, not Latin, as was previous practice. The earlier was the Estoria de Espanna which described the role of the different kingdoms in the peninsula in the formation of Spain. The second history, the General Estoria, was a much more ambitious project, a history of the world, intended as a moral guide for Christians. Begun around 1272, its scope proved too vast for Alfonso and his collaborators and it remained unfinished, reaching only as far as the parents of the Virgin Mary! A beautiful page from the Estoria de Espanna. The Estoria de Espanna (EE), on the other hand, brought the history of Spain up to the reign of Alfonso’s father, Ferdinand III (r. 1217-52). It chronicled the highlights of Spain’s history –from earliest days through to the Carthaginians, Romans, Visigoths, and the loss and recovery of territory from the Moors, the role of the kingdoms of Asturias, León and Castile in the reconquista up to the time of composition, when the country stretched “from the north coast sea of Santander to the sea of Cádiz” (González J 269). 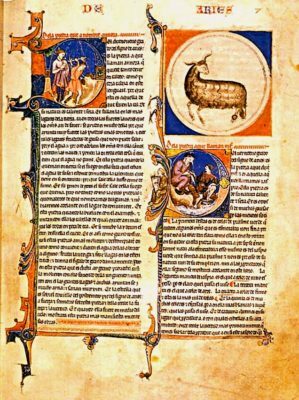 Alfonso drew on a wide variety of sources, from the Bible to classical literature, from medieval Latin chronicles to Arab historians, from ecclesiastic legends to vernacular epics. The intention was to produce a cohesive history, demonstrating that the different Christian kingdoms of Spain had a common origin in their Biblical, Roman and especially Visigothic past, and a common purpose in defeating the Moors. It is history with a very nationalistic purpose, and Alfonso took issue with all those who had obstructed the evolution of Christian Spain. He took particular issue with foreign crusaders, especially the French, who contributed little or nothing to the crusades in Spain. Their withdrawal from the battle of Las Navas de Tolosa (1212) was portrayed as a betrayal; even the change of church liturgy from Mozarabic/ Visigothic to Roman in 1085 was attacked as a change to French liturgy. Spain abounds in pasture, is rich in fruit, abundant in fish, excellent for milk and milk products; she is full of venison and game, covered with cattle, plentiful in horses, profitable in mules, safe and well provided with castles, joyful in its wines, content in the abundance of its bread, rich in metals: lead, tin, mercury, iron, copper, silver, gold, precious stones, any type of marble, in salt from the sea and salt from the land, and many other minerals… plentiful in silk, and all kinds of candies made from honey and sugar…. Oh Spain there are no words nor any talent capable of praising you enough (Carrión G 130-31). Alfonso’s nationalism, however, did not prevent him from turning to Muslim historians to fill gaps in Christian narratives. This provided an interesting historical balance and perspective (e. g. the conquest of the Peninsula). In some cases, e. g. the defeat of Alfonso VI in the battle of Ucles (1108), both Christian and Muslim versions were included. Muslim influence is also seen in the vivid, sometimes poetic descriptions and interest in small details that were normally omitted in the grand sweep of national histories. For example, describing the siege of Valencia by the Cid, the EE lists the costs of foodstuff, noting the rise in prices and the accompanying decline in quality. The horror of the situation is then brought home: And those who had some bread left buried it and did not dare show it because of what was being done to them…. And those who had nothing began to eat grass, and roots, and skins and sinews, and confections from apothecaries, and all this was very expensive. And the poor ate human flesh (transl. from Deyermond 90). Comments such as these give the Estoria a social dimension beyond its political narrative. They are part of the human experience that puts flesh on the bones of history. Alfonso also made great use of epic poems, a number of which are summarised or prosified so extensively that we can resurrect large chunks of several for which there are no existing manuscripts. As a result we get dialogues that dramatise human situations vividly. For example, shortly before the battle of Las Navas de Tolosa (1212), Alfonso VIII of Castile addresses his soldiers: Friends, we are all Spaniards, and the Moors entered our land by force and took it from us and the Christians on that occasion were almost exiled… and those who remained in the mountains turned around and killing our enemies … defeated the Moors winning back the land to the point where we are now… and now that you are here, you must help me to avenge and correct that evil that I and Christianity have suffered (Barkai 230). The use of epic poetry, with its popular appeal, was intended –like the use of Castilian– to reach out to the people and cement a feeling of solidarity with the king in a continuing crusade against Islam. Alfonso’s enthusiasm for extending the use of Castilian had a further outlet in the numerous translations he commissioned of scientific works from Arabic. It had been long recognised that the Muslims were years ahead in scientific knowledge. When Toledo fell to the Christians in 1085, a school of translators had soon formed in the city (encouraged by Raimundo, Archbishop of the city 1126-52), taking advantage of the wealth of Arabic libraries and its established Jewish population, which was fluent in Arabic. In those days, however, the translations were done in Latin, the language of knowledge and learning for Christians of the time. These were written as a “draft,” or possibly even as an oral version in Castilian, which was then put into Latin by a Christian. 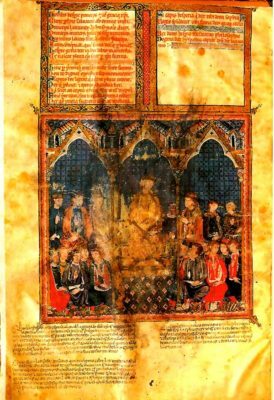 It has been suggested that Alfonso X’s decision to have works translated directly into Castilian was a Jewish initiative since they hated Latin which was associated with the Church. But it is more likely that Alfonso followed the same purpose that he had shown in writing the history and laws of Spain in the vernacular: they gave a sense of cohesion and identity to the kingdom, and at the same time increased public access and demonstrated the capacity of Castilian to express itself in areas previously reserved for Latin. It also represented a process of secularisation of culture, which had long been dominated by the Church. The translation enterprise was vast and carried out not only in Toledo but also Seville, Alfonso’s favourite city. Many of the translations reflected the king’s passion for astronomy and astrology, among them the Libro del saber de astronomia (Book of Astronomical Knowledge), a collection of 15 treatises dealing with the different constellations and with descriptions of how to construct astronomical instruments, quadrants, astrolabes etc. Such instruments were used to prepare the famous Tablas alfonsinas (Alfonsine Tables) charts of the positions of the stars and planets which, ironically translated into Latin! !, were widely used for astronomical calculations in Europe until the late 16th century. A beautiful page from Alfonso’s Lapidary. In order to be able to follow and chart the movement of the stars with precision, Alfonso organised a team of scientists to take observations for 10 years in Toledo. His curiosity about astrology produced the Libro de los juicios de las estrellas (Book of the Judgements of the Stars) and the Lapidario (Lapidary). The latter examines the supposed magical properties of different stones and gems and their relationship to the signs of the Zodiac. It is a richly illustrated work, with drawings of animals and other figures representing the divisions of the Zodiac. The observations made in these scientific works were done with a different eye from those done nowadays. For the medieval mind, the universe was God-centred, and everything obeyed a divine purpose. As a result, these works are full of moral and religious reflections; the heavens were like a book, to be read and interpreted. For example, the man who contemplates the constellation of Cassiopeia –viewed as a woman seated on a throne– will recognise in the beauty of her form and in the virtue of her presence that everything that God does is for his benefit. Alfonso’s interest extended even further. In 1251, when still only heir to the throne, he had a collection of Eastern exemplary tales, Calila e Digna, translated from Arabic into Castilian. Calila … was among the first fictional collections in Castilian, and its framed stories were to have a wide impact and influence in the development of prose fiction in Europe. Alfonso also commissioned a celebrated book on games intended for relaxation: the Libro de Juegos also called the Libro de axedrez, dados e tablas (Book of Chess, Dice and Backgammon). There are discussions on the importance and benefits of games, especially physical activities such fencing, running, jumping, stone or javelin throwing, and activities on horseback. They gave both pleasure and made a man stronger. The book also talks of the desirability of non-physical games that can be played any time of the day, and can be entered into by older or weaker men, or those who are imprisoned or travelling by sea, or by women who do not ride or are shut in. These games not only give pleasure but prevent a person from becoming lazy. At a time when the European vernacular tongues were still relatively immature and Latin the European language of diplomacy, science, business and high culture (the vernacular was limited to poetry), Alfonso’s decision to advance Castilian into those fields was a major innovation and helped to enrich the language immeasurably. Suddenly exposed to new ideas and new demands, the language acquired greater syntactic flexibility and a much wider vocabulary as it borrowed abstract, scientific and legal terms from Arabic or Latin. In addition, contact with Arabic historians brought a more vivid descriptive quality as well as social and economic interest to Alfonso’s histories, in comparison to the generally dry Latin chronicles that preceded them. Barkai, Ron Cristianos y musulmanes en la Espana medieval (El enemigo en el espejo Madrid 1991. Burns, Robert I ed. Emperor of Culture: Alfonso X the Learned of Castile and His Thirteenth Century Renaissance Philadelphia 1990. Deyermond, Alan A Literary History of Spain: The Middle Ages London 1971. González Jiménez, Manuel Alfonso X el sabio 1252-1284 Palencia 1993. Hillgarth, J.N The Spanish Kingdoms 1250-1516 Oxford1976, 1978 2 vols.